Please remember, when reporting a sighting, to leave your name and phone number along with the date, the species and location of your sighting. 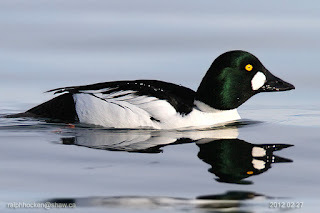 This Sunday’s Bird Walk went to the Shelly Road side of the Englishman River in Parksville. We heard a Trumpeter Swan and a flock of Canada Geese singing. We saw a Eurasian Wigeon in with a flock of American Wigeon near the shore. A Varied Thrush was spotted at the start of the walk. We had great sightings of a Western Meadowlark and a Northern Shrike along the community park fence line. A large flock of Harlequin Ducks and Common Goldeneye were seen just off shore. 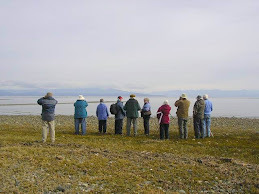 The Tuesday bird walk went to the Brandt viewing platform and Lot Ten in north Qualicum Beach. The morning was clear and sunny with calm winds, making for a very pleasant bird walk. The highlight of the morning was when we sighted four Humpbacked Whales far offshore. The whales entertained us royally for an hour as we watched them spout and breach. 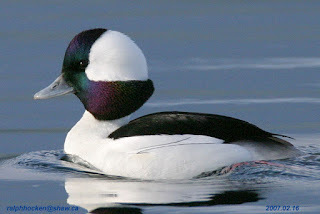 Two Western Grebes were spotted in with a flock of Buffleheads not far from shore. A Long-tailed Duck flew just above the water heading down the Strait Of Georgia. Red-breasted Mergansers, Common Mergansers and Black Scoters were seen not far from shore. At Lot Ten we watched large numbers of Glaucous-winged Gulls feeding on fish carcasses along the river banks. The Tuesday bird walk on November 07, 2017 will be going to the Englishman River, Plummer Road side in Parksville. Meet at the Parksville Community Park (at the parking lot in front of the Lions Club Playground) at 9:00 a.m. or at corner of Plummer Road and Shorewood Drive at about 9:10 a.m. The Sunday walk on November 12, 2017 will be going to Neck Point Park in Nanaimo . 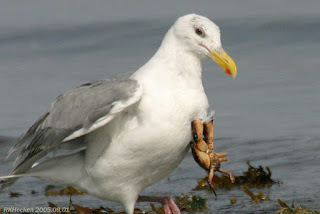 Meet at the bird store at 9:00 a.m. or at parking lot at Neck Point in Nanaimo off Hammond Bay Road at about 9:15 a.m. The Sunday Birdwalk leaves the Birdstore at 9 a.m. on Sunday Mornings. The Parksville/Qualicum Beach Tuesday Birdwalk leaves the Parksville Beach Community Park (at the end of Corfield) at 9 a.m. on Tuesday mornings. We meet near the parking area at the Lion's Playground. The Tuesday Birdwalk is not held during the summer months (July & August). It resumes the first Tuesday in September. Want more information? Call the store at 250-390-3669.
e.g. If you're making enough solution for an 8oz hummingbird feeder: 1 cup water with 1/4 cup or 1/3 cup sugar. You can use hot tap water for making your solution, as you do not need to boil your solution. We don't recommend going any sweeter than 1 to 3 for the sugar water ratio. Please only use plain white table sugar (no honey, agave, stevia, raw/ organic sugar) as this best replicates natural nectar. If your sweetener causes the solution to turn yellow or brown, it isn't recommended for the hummingbirds.